The moment we found out that our daughter, April Rey, would not be able to survive outside of my body, we knew we wanted her life to touch others in some way. We knew that we wanted her life to serve a purpose and to help others. Unfortunately, we quickly found out that, with a condition like trisomy 13 that affects all parts of the body, she was not a candidate for organ donation. We then turned to the second best option- donating her body to science and research. We wanted medical students to be able to learn from her. We wanted research to be done on trisomy 13. And so we searched for a place to do just that. It was far from easy to find this path. We hit roadblock after roadblock. I remember even reaching out to Facebook friends to see if anyone anywhere had any ideas on where we could donate her body. It seemed no one would accept her with her chromosomal abnormality. It was devastating and very frustrating that we weren’t finding a way to fulfill this desire of ours. It was one of those things that just fell into place perfectly. The wife of the architect that works with my husband, knew one of the department heads at NIH, who knew just who we should contact over at the University of MD Brain and Tissue bank. It was one of those moments that we’ll never forget. My heart just about exploded. We were going to find a way to do this. It turned out to be the perfect path. The University of MD has a Brain and Tissue Bank, and they specifically accept donors with trisomy 13. We met with our genetic counselor at Johns Hopkins (through the fetal therapy group), and explained our wishes with her as well. She helped to coordinate our efforts and make sure that after her autopsy, April’s tissues would be sent to the brain and tissue bank. Her remains would then go to the Maryland State Anatomy Board for cremation. 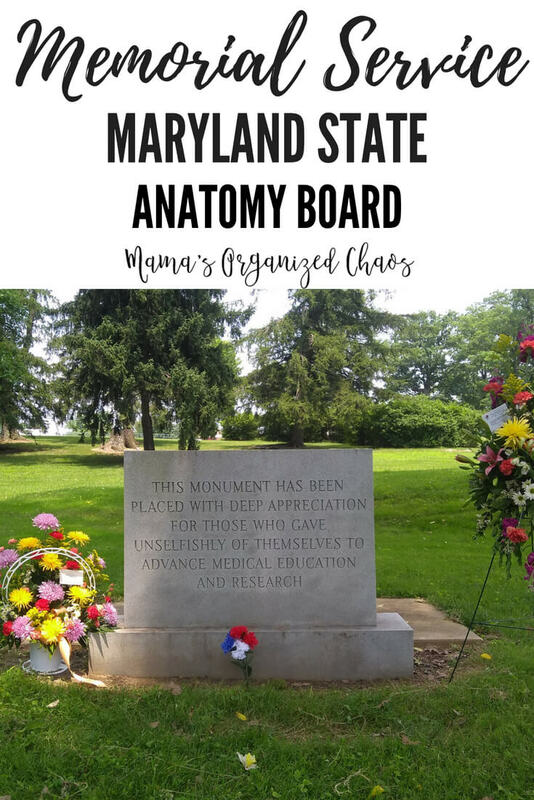 The Maryland State Anatomy Board, is actually where my husband and I want our bodies sent, and have put that in our wills. When I had originally contacted them, however, with regards to April’s body, they wouldn’t accept her. They do not accept any bodies under the age of 18 that can’t sign for themselves. But, in going through Johns Hopkins, we were able to send her remains and at least have her cremated there. Every year, they hold a memorial service and spread the ashes of all bodies that were donated in their memorial garden. That was perfect and we were glad to have a memorial service to attend. Well, June 2018 rolled around, and it was time. 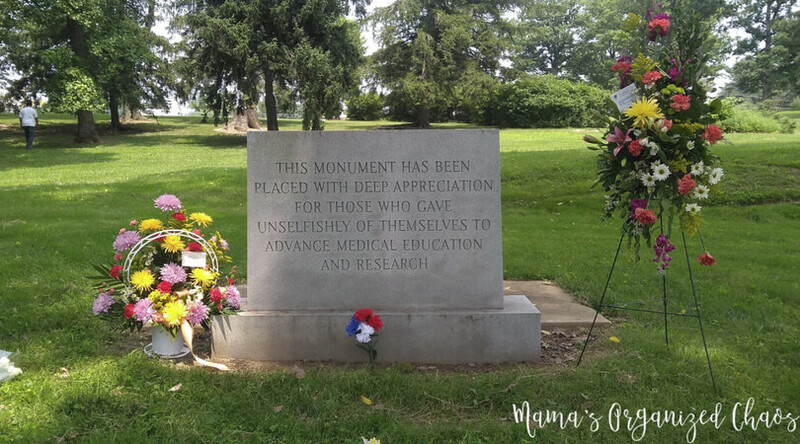 10 months after April’s birth, we’d be traveling to Sykesville, MD to attend the memorial service. What I didn’t realize is how emotional it would be. My husband is busy. SO busy in the summer. I told him several times that it was ok to not attend. He insisted, and I am so glad he did. As I drove towards the memorial garden my tears started. I could feel the fact that we were getting closer to where our daughter’s remains were. It was shockingly emotional to me, even though it probably shouldn’t have been. I cried and cried so hard. We arrived early, as we do to most everything. I was so glad. There was the monument placed in the garden. There were benches and two other women sitting. I walked right to it. I took a couple of pictures and then sat down. The tears wouldn’t stop. I missed April so much in that moment. I was so glad we were there early. I had a chance to sit and just be with our daughter. Unfortunately, my husband was having to walk around with Caroline as I took my moment, and the two women sitting near by wouldn’t be quiet about their fit-bits and small talk, even through the obvious sobs coming from my direction. But, nonetheless, I had a nice little moment with our girl. It’s not our style to have a grave site, or to keep ashes in an urn. But I am very glad that we have this monument to go to whenever we feel the urge. I am glad there is a place. While I know that April is with us wherever we go, and she lives inside of each of us, this place was such a comfort. Brain and Tissue Donation of Trisomy 13 Babies– The University of Maryland in partnership with NIH, accepts brain and tissue donations from babies that have trisomy 13.